The feathers of newly hatched Bald Eaglets are light grey, and turn dark brown before they leave the nest at about 12 weeks of age. During their third and fourth years, Bald Eagles have mottled brown and white feathers under their wings and on their head, tail and breast. The distinctive white head and tail feathers do not appear until Bald Eagles are about 4 to 5 years old. Their beak and eyes turn yellow during the fourth and fifth year, and are dark brown prior to that time. 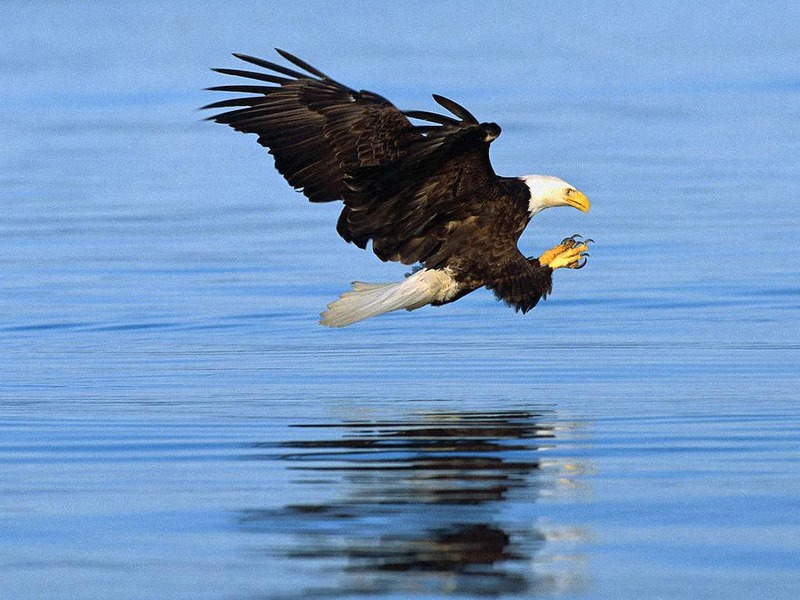 Bald Eagles are about 29 to 42 incles long, can weigh 7 to 15 pounds, and have a wing span of 6 to 8 feet. This makes them one of the largest birds in North America. Females are larger than males. Bald Eagles residing in the northern U. S. are larger than those that reside in the south. They have a life span of up to 40 years in the wild, and longer in captivity.